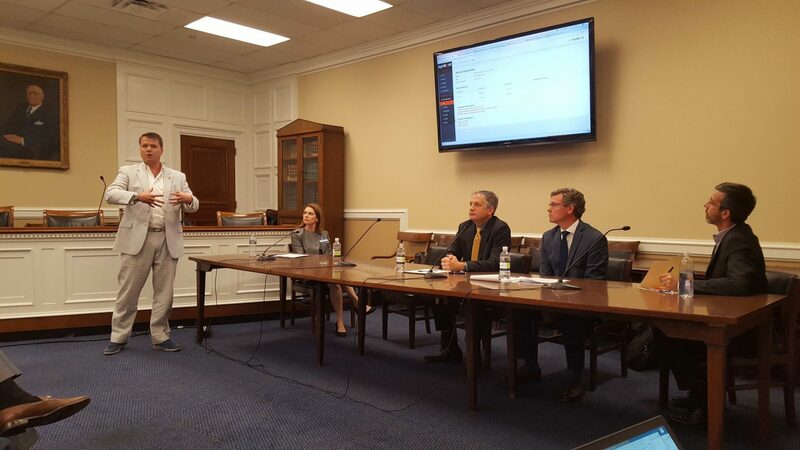 As such, it was one of the more notable events during a busy Congressional Blockchain Education Day, an event put on by the non-profit Chamber of Digital Commerce as a way of introducing more lawmakers to the technology and its potential to reshape industries. The Symbiont application is notable as it was developed alongside regulators, specifically those backing a new Delaware law that could soon legalize the use of blockchain technologies as a means to store and transfer securities records. Introduced in May, the bill has been approved by lawmakers in both House and Senate, and is expected to become law after a signature from the state’s governor. Within this context, Smith highlighted how the product could be used to issue and register shares of stock, allow for shareholders to proxy vote on corporate decisions and enable them to view previous transactions and share issuances through the company’s capitalization table. In the demo, Smith highlighted the speed and utility of the platform by recording a congressional staffer’s data on the blockchain, and then issuing him shares of a mock corporation along with the necessary certification. The decentralized nature of the application means that no single entity has control over how votes are counted and ensures that all relevant parties – whether they be investors, administrators or regulators – have real-time access to a company’s current cap table, as well as previous share issuance transactions. Symbiont said that the tool has the ability to dramatically improve corporate governance by giving shareholders more say and injecting greater transparency into how decisions are made. Ron Papanek, managing director at Symbiont, went on to highlight that the smart contracts in use will not proceed with the issuance of new shares – thereby diluting the value of existing shares – without sufficient approval from current shareholders. He emphasized that legacy proxy voting systems are overly dependent on the company collating and tallying the votes, and pointed to several recent occurrences where votes were discovered to have been miscounted. Symbiont’s application seeks to solve this problem through decentralization, whereby each node – whether a shareholder, administrator or regulator – operates the software and verifies transactions independently of one another. “We’re not trusting the corporation for record keeping, we’re trusting the software to validate all transactions, and consequently, all parties can trust the veracity of that data,” said Papanek. In a nod to practicing what it preaches, Symbiont said it will transfer its securities and equity records over to the platform as soon as it is able to. “We’re going to be among the first to convert. We’re going to eat our own dog food,” said Caitlin Long, the startup’s president and chairman. Symbiont claimed that the application is fully functional and ready to be commercially deployed. Further, it said there are several prospective clients waiting in the wings to begin utilizing it once the Delaware legal framework is firmly in place. However, the company sees the range of potential use cases for its application expanding well beyond the tiny mid-Atlantic state, which is a preferred corporate domicile and home to 85 percent of all initial public offerings (IPOs) listed in the U.S. Through a relationship with alternative asset platform Private Market, Symbiont will also be offering the application to non-U.S. companies. Other use cases in the works include loan syndication and the archiving of public records.